Strong atmosphere and smooth presentation help this dark underground shooter overcome most of its minor problems. 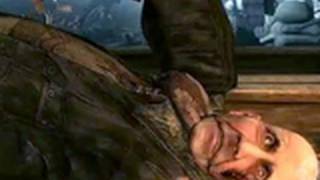 Metro 2033 is an interesting post apocalyptic first person shooter set in the Moscow underground train tunnels. The game focuses much of the action against mutated creatures that put the scattered human outposts under siege in a vast network of tunnels. The presentation and atmosphere qualities are very high throughout creating a rich immersive world. There are some impressive visuals tied directly to the lighting and smoke effects that really set the mood of otherwise sterile surrounds. At times the shooting can be impressive against a few different mutants and hostile Russian soldiers. Metro attempts to give you some brief stealth options to bypass or take down groups of mercenaries but the game feels much more at home shooting anything that moves. Although there are some neat elements shown Metro is a linear game and there isn’t much deviation from the designated path which does aid its graphical qualities. Visually Metro is a great looking game, the textures are crisp and detailed and the animation is smooth and realistic. There are some really good lighting effects where headlamps and artificial lights have a real volume and texture to them. They shine through the sometimes dense smoke that increases during heavy gunfights. Dust particles float through your vision as you move between water puddles or train cars. During some story segments you lose control of your character and are shown a fully animated in game cut scene, these are usually impressively directed. The few city hubs that you come across are quite populated but there is not much interaction aside from buying supplies from the traders. Much of the tunnel system is very dark, night vision goggles and a rechargeable flashlight will guide you in the eerie interconnected tunnels alone or with companions. Not all of the action in Metro is carried out on your own and many sections involve one or more characters, early on this serves as a natural tutorial for the dangers of the underground. It is perhaps because of this that the game is rarely scary on the level of similar shooters. There are some good sections but they lack the heightened tension when you have an ally by your side. That doesn’t mean there aren’t a few good scares to be had, just not nearly enough considering the effort made to make you feel a part of the world. You occasionally venture to the surface of Moscow to observe the destruction and desolation, the cold of nuclear winter and the poisonous air requires the use of a gas mask. This gas mask will save your life on more than one occasion above and below the surface. If you take enough damage and stand in the cold the mask does become hard to see through. The gas mask also obstructs the faces of characters and this is often their only unique feature in a world of similar looking humans and mutants. Most of the hectic action is against Mutant creatures who like to get up close and attack directly. There are hairy mutants, lumbering mutants, hairless mutants and even some flying mutants. Almost all are fairly large human sized creatures that move and strafe you naturally. Unfortunately aside from the winged mutants they are pretty hard to differentiate in the darkness unless they are close. To keep them from slashing you to death you’ll need to run around to get yourself clear and then unload precious rounds into them. There are a lot of action pieces where you are standing in the one place defending yourself and your buddies from a horde of creatures. Sadly the simple run around like a madman and shoot tactic seems to work for all enemies. One section in an open train station featured the constant onslaught of melee mutants while I was tasked with trying to seal off their tunnel entrances. Walking behind columns hearing muffled gunfire in the distance as mutants ran beside me in the smoky darkness was certainly a highlight. Mutants aren’t your only opposition though as numerous armed humans aren’t friendly. Human conflict is alive and well despite war ending the world as we know it and you’ll need to take down some of soldiers to progress. They do have good aim and some dynamite grenades which I barely used due to the slow and weak throwing action. Gunfire will cause enemies to stagger and in the darkness audio moans will let you know of their demise. Several of them take cover on the wrong side of objects giving you a free shot. To break some of this combat up you can engage in a little bit of stealth if you desire. Lamps can be turned off and light globes shot out (or generators disabled) to darken rooms then you can use throwing knives or silenced weapons to take down humans from behind. The detection from your foes is unrealistic as either they ignore you or spot you in pitch black. The stealth is merely an option but a clumsy one, shooting the multitude of weapons was definitely more engaging. The game has a range of swappable weapons and the bullets are used as the game currency. You will need to collect as much ammunition from dead soldiers and stashes as you can. At town hubs you can buy or trade ammo and buy expensive weapons but without any stats you can only guess at their effectiveness. Outside of these human outposts there are usually obvious ammo caches in crates or lockers. However ammo is still very limited especially in some of the later levels, you may acquire a horde of ammo for a weapon you do not even have anymore. With no trader I was limited to using a knife and some dynamite for a few consecutive levels near the end of the game which was very unappealing. On more than one occasion I collected only a couple of bullets from dead renegade soldiers. Some enemies take dozens of bullets before collapsing at your feet. There are some fascinating visual displays early on relating to ghosts and anomalies but they aren’t used nearly enough. Ghosts of people who lost their lives in the tunnels appear before you in some of the emptier tunnels. They show up quite early and came as quite a surprise to me. The ghosts block some paths and are seen as black silhouettes when you shine your flashlight at them. One character chants his way past several of these ghosts and I don’t recall seeing them again, no shadow puzzles and no warning messages. In a similar vein an imposing great looking anomaly is shown and then only used once impressively. This anomaly moved slowly through the tunnel and killed anything that moved. After disposing of a huge number of mutants it is barely sighted again and nothing really replaces it. It’s a bit of a shame these interesting segments are implemented but do not develop into something more throughout the game. The single player takes you through many similar looking tunnels, on carts, trains or briefly across the toxic frozen surface. The entire game is pretty linear and you’ll come across strategically placed town hubs to restock and discover other characters to guide your way. These hubs are fairly limited on interaction although they are presented nicely. The action segments against humans do offer multiple attack points but it doesn’t really change the basics. The entire campaign can be completed in around seven hours and on normal the game is fairly easy with regenerating health. The game uses a checkpoint save system and most of the time it functions pretty well as far as checkpoint save systems goes. Not having multiplayer and a fairly limited amount of replayability may make picking this game up a tough decision. However if you love sci-fi first person shooters with a taste for atmosphere then Metro meets the task more often than not. Metro 2033 is certainly not a bad game, but little things mar the otherwise enjoyable atmosphere rich experience. The graphics are certainly a major success but underutilized and certain good qualities aren’t expanded on. There are some nice touches that really make you feel immersed in the world. A lack of variety in the enemies, combat situations and limited scares turns some of the action into a chore at times. There are some fun cart rides to be had and some well animated sequences littered during your journey. Having extremely limited ammunition and an underdeveloped stealth component does hold the game back a little. The neat ideas such as pumping pneumatic weaponry to increase damage don’t impact much on the gameplay. No time for reading! There are mutants to be killed. There is no doubt this game is more controlled and carefully directed than something like Stalker but it has to be because it’s so linear. In comparison to the heavily atmospheric Cryostasis it does fall a bit short in all but the action and presentation qualities. Metro 2033 is definitely a game worth looking at but maybe not for the full price. Good crisp graphics with nice effects, textures and fluid animations. The smoke and thick lighting just brings it all together to form an engrossing atmosphere. Sounds also work well in the environment. Some good shooting and neat immersive ideas, stealth feels basic at best but more often sloppy. Not a lot of variety to the shooting or gameplay and it sometimes becomes a bit of a chore. A linear experience taking around seven hours with not quite enough variety and many undefined sections, characters aren't with you for long and at times your objective isn't really clear. On high the game looks really good but it does take a monster PC to run on maximum with no settings in between. Levels load quickly and are relatively bug free but it feels like it runs a lot slower than the framerate indicates. 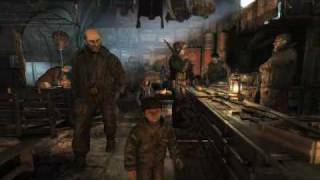 Metro 2033 offers good atmosphere and presentation in a well controlled underground network of tunnels. It has some neat ideas and nice shooting but is let down by several compounding minor issues. The highlights for me so far are the graphics and the all the immersive ideas - i think more First person games should try and maintain the camera for the duration, little things like sitting at a table guzzling vodka with your mates really brings you into the game. Good review, i agree with it from what i have played so far. "Strong atmosphere and smooth presentation help this dark underground shooter overcome most of its minor problems." Metro 2033 is ranked #598 out of 1435 total reviewed games. It is ranked #67 out of 118 games reviewed in 2010.